The erstwhile Soviet empire got bogged down in Afghanistan and finally got disintegrated. The major reason for her defeat was Soviet army itself which was organized, equipped and trained for big and conventional wars in Europe and not the insurgencies in countries like Afghanistan. Soviet generals, therefore, were prosecuting the wrong kind of operations which involved a lot of lethal action, a lot of heavy bombing, targeting villages, and employing airpower excessively and indiscriminately. Another reason was that they basically misunderstood the nature of Afghanistan and tried to impose a communist social design without asking the Afghan people if they wanted or not. The NATO army leaders, in today’s insurgency in Afghanistan, do not have a mindset different from that of the Soviet generals. It’s rather a large impediment to begin countering insurgents when you are organized, equipped and your doctrine is focused primarily on conventional war, it makes a lot harder to sort out how to deal with an insurgency. Then in 2009, the U.S. military transformed its culture and counterinsurgency became a mission with specific DOD guidance on balancing capacities and doctrine between conventional war and counterinsurgency and irregular warfare. These lessons should have been learned after the Vietnam War as Vietnam War was pretty much a similar insurgency that the US is countering in Afghanistan. A critical challenge for the NATO forces in Afghanistan is to be able to leave Afghanistan without the stigma of defeat and this is what the militants try hard to make impossible for the occupation forces. If the recent instances of Green-on-Blue attacks are any indicator, the fate of NATO is not going to be any different from that of the Soviets. The war that the Americans are fighting has become a war of perceptions. The use of predator drones to kill militants may have proved cost-effective but it has changed the public perception about the moral and legal aspects of the conflict. The militants try to exploit each and every drone attack and pressure the pressure groups like media, politicians et. al. to condemn the attacks on the grounds that drones are killing innocent people. This is a fine endeavor to divert the public attention from bomb and suicide attacks which have so far killed more than 40,000 in Pakistan alone. Thus, in effect, the drone attacks are helping the militants. Will the US and Co will be leaving Afghanistan in their underpants, the way Soviet president described the eventuality of defeat? In other words, is the US and allies are failing in their counter-insurgency operations like the Soviets did. 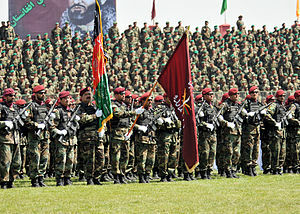 According to statistics compiled by The National Interest, the US and the allies have lost more than 2000 soldiers since 2001, half of that number came in the first nine years of the campaign and the second half came in just the past twenty-seven months, after the implementation of the counterinsurgency strategy (COIN) in Afghanistan. Another major impediment to the success of COIN is that US administration has not been able to sell it neither to the domestic audience nor the people of Afghanistan. The empirical data shows that in the first nine years of the war in Afghanistan, one thousand U.S. military personnel were killed. That same figure of one thousand killed was reached in just the past twenty-seven months after the U.S. officially adopted COIN as the strategy in Afghanistan. In other words, since the time that United States sent thirty-three thousand additional troops as part of the Afghan “surge” and issued guidance to its military forces in Afghanistan to follow the COIN strategy, the number of U.S. troops killed doubled. The political decision to implement the COIN strategy failed to recognize that more people with more guns on foreign territory cannot win the battle for hearts and minds. COIN, for all its positives, seemed to offer too romantic a notion of what was actually achievable, especially in a large-scale military campaign such as the one that Afghanistan ultimately became. Regardless of whether new U.S. military personnel smiled more or were culturally attune or were more ethically upright or whether they now teamed up with diplomats, aid workers or anthropologists (who normally donned bullet-proof gear and carried weapons), building trust in such an environment was simply impossible. The Green-on-Blue attacks, a very recent phenomenon, clearly suggest that counterinsurgency has proved to be counterproductive. During exercises and operational planning, the Americans assign Blue color to their own forces (including the allies) and green color to the host nation. Red color signifies the enemy. Thus, attacks by Afghan security forces personnel on NATO soldiers are described as green-on blue by the Pentagon / NATO Headquarters. This shows infiltration of Taliban groups into the ranks of Afghan army. An army cannot be raised in an overnight timeframe; it has to be developed overtime with inculcating the time-honored conventions of comradeship and institutional traditions. It should have a clear conception of an enemy and its traditions are to be wedded with social realities. An “army” put together hurriedly is prone to so many vulnerabilities including the outside influence of militant groups. According to TIME, nearly a quarter of all combat fatalities in Afghanistan this year were “green on blue” attacks forcing NATO to put on hold the training of around a thousand recruits. With the present level of loyalty, reliability and professionalism of those 350,000-plus Afghan troops, Washington and Brussels should be worried about the success of endgame in Afghanistan. NATO is introducing a number of new measures to deal with the crisis: it is scaling up its counterintelligence teams, instituting new interview procedures for Afghan soldiers returning from leave, establishing a warning system for insider threats and enhancing cultural training for Afghan personnel. Still, in a country with such strained resources and few written records, it remains unclear how effective these improvements can be. In his paper titled Anatomy of Green-on-Blue Attacks, Ehsan Mehmood Khan concludes that surge in green-on-blue attacks is certainly consequential. It has far-reaching effects insofar as NATO’s strategy and strategic ends in Afghanistan are concerned. The state of affairs is not very healthy for NATO as it nears completion of 11 years in Afghanistan. The situation is so precarious that armed NATO soldiers have been deputed to monitor the Afghan soldiers so as to protect the Westerners. The analysts think that these ‘Guardian Angels’ won’t fix a flawed Afghan war policy. This is, indeed, the pinnacle of mistrust between the green and blue fragments of a force otherwise thought to be performing the same task towards the same strategic end. When the Blues attacked the Greens with all their military might in 2011, they had no idea that the tide could turn in an opposite direction. So far it had pinned all its hopes, and bet all its dollars, on the loyalties of Afghan forces. With the alarming shift of positions, it is not difficult to predict the fate of much cherished endgame. How drone strikes help the terrorists…. We have had a problem with blue-green algae blooms in Canada too.